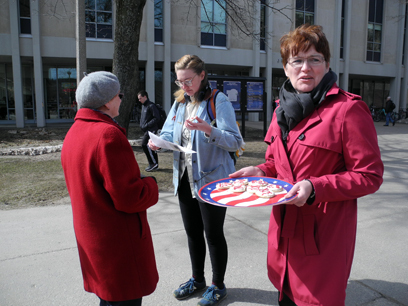 Garrett Neese/Daily Mining Gazette League of Women Voters members pass out pamphlets and cookies at Michigan Technological University’s Equal Pay Day. HOUGHTON — Nationally, women earn about 80 percent as much as men for full-time work, according to 2015 federal statistics. Members of the Copper Country League of Women Voters came to Michigan Technological University Tuesday to spread awareness of the wage gap. The LWV held the event nationwide on Equal Pay Day, or the point in the next calendar year into which a woman would have to work to earn the same salary as a man. “Over a lifetime of working, it could be as much as half a million dollars or more, depending on the wage that they’re receiving, compared to a man and the gap between them,” said Kathy Flagstadt of Copper Country League of Women Voters. The gap stems from factors such as choice of profession and becoming a parent. But a gap remains even after controlling for factors such as occupation, hours worked, or marital status, according to the American Association of University Women. It stood at 7 percent for male and female college graduates one year after graduation; by 10 years after, it had risen to 12 percent. LWV members passed out pamphlets to passersby, as well as cookies decorated with “80%.” They also encouraged people to support the Paycheck Fairness Act, a federal bill that would stop employees from punishing people who share wage information and allow workers to sue for punitive damages over wage discrimination. They also back changes in state law, as well as advocating for fair wages for female colleagues and friends. The 80 percent mark is up from 79 percent in 2014. Women in Michigan earn 74 people of what men make, the eighth-largest gap in the country. Flagstadt said they’d gotten a positive response from students. Amy Joy Patterson, a third-year psychology major, said gender equality would help the stability of society.